Steve Curry (Georgia Southern) scored what would prove to be the winning running by reaching base to lead off the top of the ninth inning and scoring from first base on a three-base error, and Jake Ortega (Bakersfield) picked off the potential tying run off third base to end the game as the Orange County Riptide beat the Academy Barons 4-3 today at the MLB Youth Academy. Leading 3-0 after Curry doubled and Mason McWhorter (Georgia Southern) tripled him home in the seventh inning and scoring twice in the eighth inning on an error and a wild pitch, the Riptide scored their winning run in the ninth after Curry was hit by a pitch to put Orange County up 4-0. They would need every one of those runs as the Barons rallied for three runs in their half of the ninth inning when an error and two walks loaded the bases with one and Jacob Shanks (UC Riverside) hit a two-run double and Andrew Wilson (Marymount-NAIA) hit a sacrifice fly to plate one runner and advance Shanks, representing the tying run, to third base. Jacob Parker (Georgia Southern), who entered the game after Shanks’ double in relief of Jack Noble (Oregon) and surrendered the sacrifice fly, threw one more pitch and that is when Ortega, the Riptdie catcher, picked Shanks off third base to end the game. Issac Guerrero (Faulkner) started on the mound for the Riptide, striking out six in four shutout innings before being relieved by Brandon Ivey (Texas) and Noble who each threw two shutout innings each before Noble ran into trouble in the ninth. Spencer Hereford (Dominguez Hills), the starter for the Academy, threw six shutout innings while striking out six before being relieved by Andy Rosales (El Camino), who allowed three runs on two hits in one and two-thirds innings, and Alonzo Billips (Santa Clara), who recorded the last four outs without allowing a hit but was on the mound when Curry scored in the ninth. 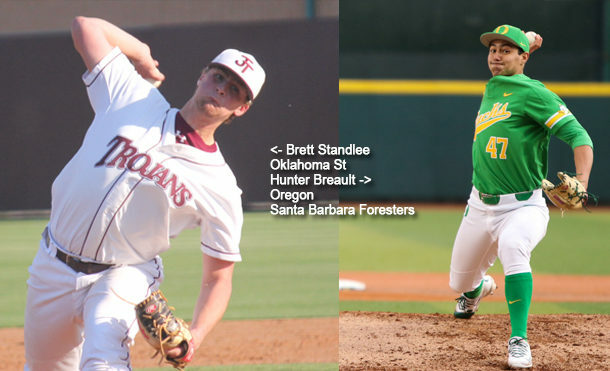 Brett Standlee (Oklahoma State) and Hunter Breault (Oregon) outdueled Dylan Francis (Cal Poly Pomona) and Jackson Simonsgaard (Roger St), and Ryan Cash (Oklahoma St) drove in the only run of the game with a two-out RBI-single to lead the Santa Barbara Foresters to a 1-0 win over the Conejo Oaks today at Pershing Park. Standlee, who started for Santa Barbara, was good today but Breault was perfect. Standlee surrendered three hits and three walks, facing runners on base in each of his four-plus innings, managing to pitch out of every situation until his second walk allowed in the fifth inning prompted the Foresters to bring in Breault. Breault retired all 13 batters he faced, striking out five and extending his scoreless inning streak the season to 21 innings. Francis, who started for Conejo, was almost as dominant as his counterparts, allowing only five baserunners over seven innings, two via hits and three via walks. One of those walks, to Turner Gauntt (Texas) to lead off the third inning, came back to bite Francis when, after a sacrifice advanced Gauntt to second and a groundball out advanced him to third, Cash hit his single with what proved to be the winning run. The only other hit Francis allowed was a bunt single by Logan Allen (AR-Ft. Smith) to lead off the seventh inning. Simonsgaard pitched around a lead off single by Gauntt in the eighth inning to keep the score 1-0. Jordan Chriss (Columbia) struck out eight and allowed only one run in seven innings, Luc Lipcius (Tennessee) hit a three-run home run and scored three times, and Brian Klein (Texas Tech) had three hits, scored twice and drove in a run to lead the San Luis Obispo Blues to a 10-3 win over the Healdsburg Prune Packers tonight at Recreation Park. The run Chriss allowed came in the first inning when leadoff hitter Kevin Sandri (Pacific) doubled and scored one out later when Brian Arias (San Antonio), who would finish with a game-high three hits along with Klein, hit an RBI-single to give Healdsburg the early lead. From that point on, however, Chriss was dealing. After Arias’ hit in the first inning Chriss retired the next eight batters he faced, 13 of the next 14, and 20 of his last 23. The only blip Chriss faced the rest of the way was a two out single surrendered to Sam Wezniak (Cal) in the fifth inning followed by a walk to Sandri. Chriss retired the last out of the inning on a groundball and then retired the side in order in the sixth and seventh innings before handing the pitching duties over to Mario Lopez. By this time the Blues had scored seven times: twice in the third inning on RBI-singles by Blayne Jones (Dallas Baptist) and Klein, once in the fourth on a bases-loaded walk, and four times in the fifth without collecting a hit, scoring via two errors, two walks, a hit batsmen, a bases-loaded balk and a fielder’s choice. Lipcius added the capper in the ninth inning, hitting his home run after Klein and Jason Lutes (Pepperdine) singed in front of him with one out. The Packers added two runs in the eighth inning when Sandri doubled for the second time and scored on a Kurt Wilson (Texas Tech) double, and Arias drove in Wilson with a single for his second RBI of the game. Lopez retired the last two batters in the eighth inning to escape further damage and then pitched a scoreless ninth to secure the win. Griffin Hattingh (Houston) started on the mound for Healdsburg and allowed three runs on five hits while striking out two in three and two-thirds innings. 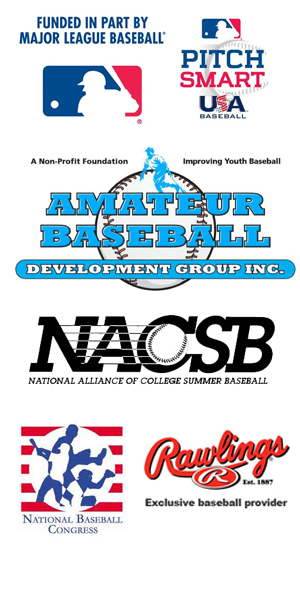 Jackson Cunningham (Northridge) retired the first eight batters he faced, three via strikeouts, in relief of Ed O’Bannon, who pitched two-thirds of an inning and allowed four runs (one earned). Sam Reinertsen (Davidson College) pitched a scoreless eighth inning in relief of Cunningham but gave up the three Blues runs in the ninth.